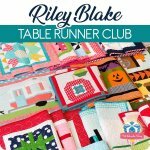 Each month you will make a table runner that you will be able to use the next month. Even though this is a Pick Up & Go box, and not a scheduled class, we will be available to answer any questions. This is a 12 month commitment.